The RN4870/1 is a small (only 12mm wide) BLE module from Microchip. What makes this a little bit special (when compared to modules like the HM-10) are the advanced features that allow you to create your own services and characteristics. This opens up true BLE functionality. It has been available for a while now and I am surprised it is not more popular in the hobby area. 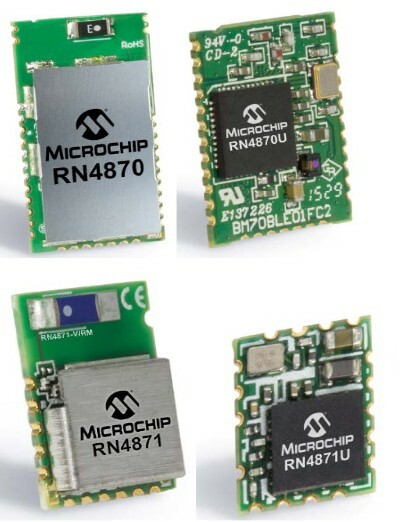 The RN4870 is very different to common hobbyist modules like the HM-10, AT-09, and BT05 and if this is all you have used you may need a refresher on BLE. Especially if you want to use your own services and characteristics. This is a first look / getting started guide that I will add to as I get time. The RN48709/1 is configured using ascii commands similar to other BT modules. The main difference s that the The RN48709/1 has it’s own set of unique commands and does not use AT style commands. It also has a mini programming or scripting language built in. This means, depending on what you want to do, you may not need a MCU like the Arduino, the RN48709/1 can be used stand alone. 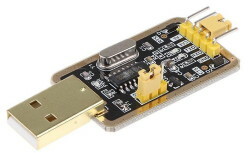 The UART Transparent Service for Serial Data allows an easy way to link 2 modules together. This can be considered a serial cable replacement, however, if this is all you need you may be better suited with the HM-05/06 or HM-10. The RN4870/1 is available is a few different sizes/configurations. With shielding, without shielding, with antenna, without antenna, all pins available, only basic pins available. 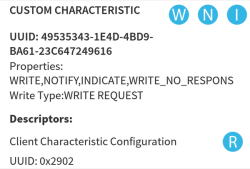 Image from the Microchip RN4870/1 data sheet. The ones I have are the RN4870-V/RM118 version. With antenna and all pins available. These modules are more expensive that the common hobbyist modules like the HM-10 but they far more advanced, well supported with full data sheets and a user forum. Most questions, if not all, will have already been answered on the forum. User guide, data sheet, firmwares and update tool. Same page as above, click the Documents tab and scroll down. Technical details. This is a website with lots of details. Use the menu on the left. The RX4870/1 is a very small SMD board which makes it a little difficult for hobbyists. 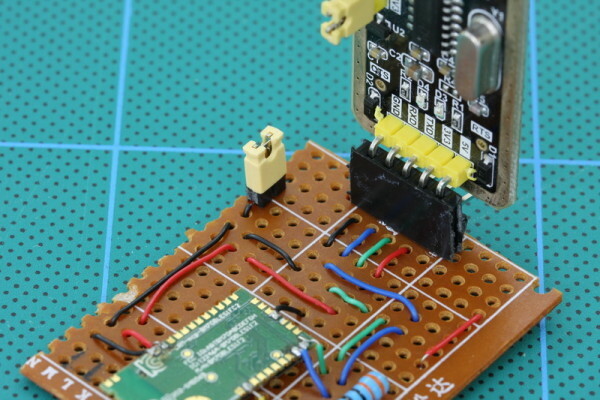 A basic breakout board can be built if you have fairly steady hands. Here is my rather lack lustre attempt. I mounted the module upside down so that I still have access to the pads should I need to add more connections later. Not the best soldering I have ever done but the board is very small and the iron tip has seen better days. 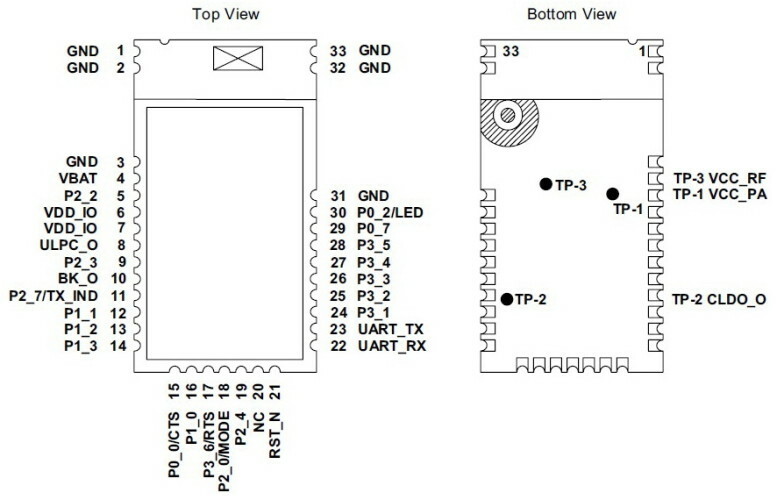 The jumper is connected between pin 18/P2_0 and GND. 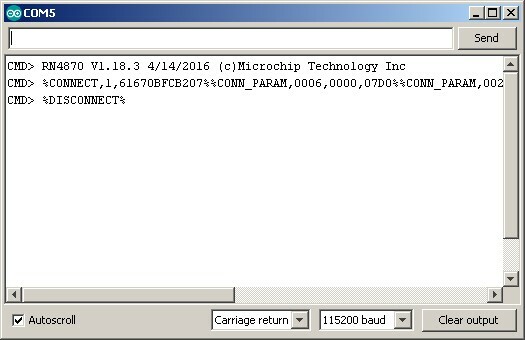 With pin 18 brought to GND when the modules start they enter programming mode. This allows you to update the firmware. 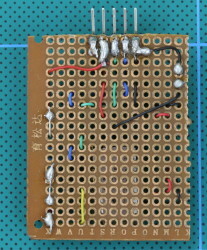 The jumper is a simple way of connecting pin 18 to GND. The connections are arranged to match the usb/serial adaptor I am using. Here is a second board which is slightly smaller. This one has a wire connected to the programming pin. I simply connect the wire to GND when I want to enter programming mode. The extra pin/socket on the end is not used. You will notice that I used different pins for GND and VCC from the RN4870. This allowed me to use 2 pads to solder the wires which made life a little easier. I am surprised that there are not more pre-made breakout boards for this module. The only one I can find is the RN4870/1 Click from MikroElektronika. Jon Raymond contacted me to say he has created his own breakout boards (which look very nice) and is hoping to release the designs at some point. See Jon’s Twitter feed for pictures. 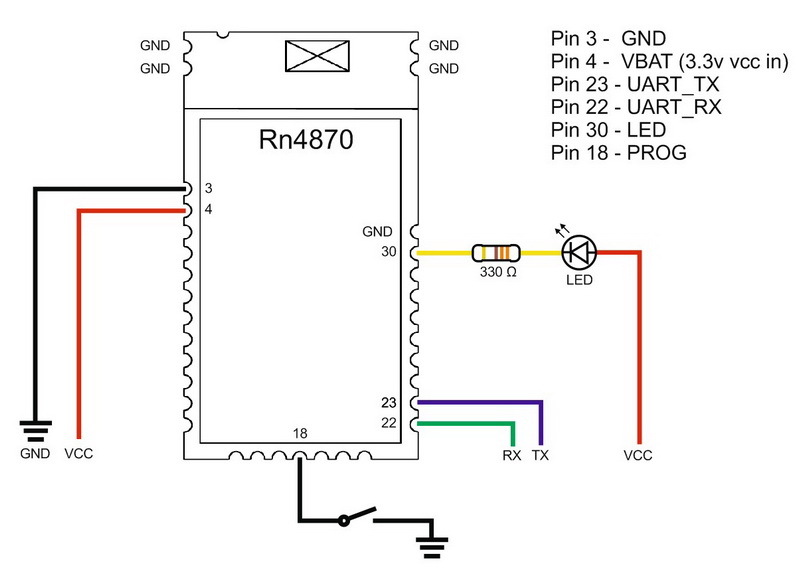 These are all you need to use the module but it is a good idea to add a LED to Pin 30 so you know if it is on or not. Remember that RN4870 RX goes to usb adaptor TX and RN4870 TX does to usb adpater RX. The data sheet has full details for the other pins. New modules have a basic beacon set up and we can use this to test if the module is working or not. For this just add vcc and GND. Remember these are 3.3v devices so use 3.3v not 5v. Power the module, then use a BLE scanner app to find the beacon. Here I am using Android BLE Scanner by Bluepixel Technologies LLP but there are many similar apps. Open the app, you should see the RN4870 (it will not have the same name), connect and the LED should change to 2 quick blinks every second. – Read the characteristic data by clicking the small R icon. You should get the name again. Now we know it is working we can try talking to it through a serial terminal program, something like Tera Term or the Arduino IDE. To talk to the RN4870/1 we need a usb to serial adaptor. I am using this one but other 3.3v versions will work. Make sure it is 3.3v. At a push you could use a spare Arduino but I don’t go in to this here. Here is a adapter I am using. 3.3v or 5v can be selected. Connect the RN4870 to the usb adapter and connect to a PC, note that I am using Windows 7, this will give you a COM port. Mine is COM5. Yours will be different. For the first few examples I am using the Arduino IDE. The Arduino IDE does not have local echo (it does not display what you have entered) but you can turn on local echo in the RN4870 with the “+” command if you wish. Use the “+” command after entering data mode. 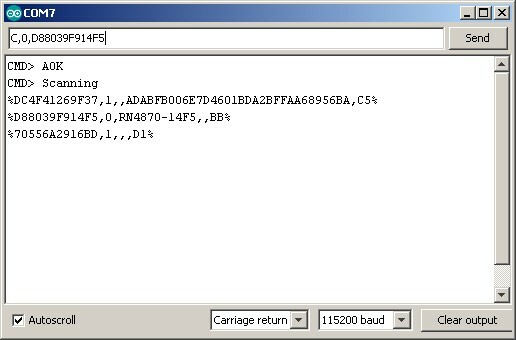 If you check the data sheet you see that it has a default baud rate of 115200 and all commands require a carriage return CR character (\r). If the world loves you, or even likes you just a little bit, you will get a “CMD>” reply. To return to data mode use “—\r”. This is 3 dash or minus characters + CR. Now change the line endings back. There are a few commands that return data (these are called GET commands). One is the “D” command and another is “V”. “D” returns information about the device and “V: returns the firmware version. The “V” command returns the firmware version. Here you can see that the modules I have are using firmware V1.18.3. This is not the latest and I will look at updating it later. 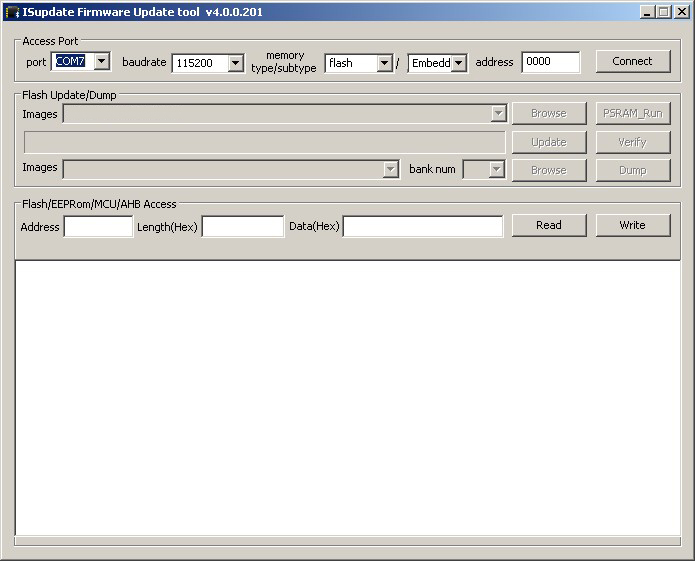 The latest firmware, at the time of writing, is v1.28.3 v1.30. “GNR” gets the name of a connected device. Of course, for this to work the module has to be connected to something. With the serial monitor still open. 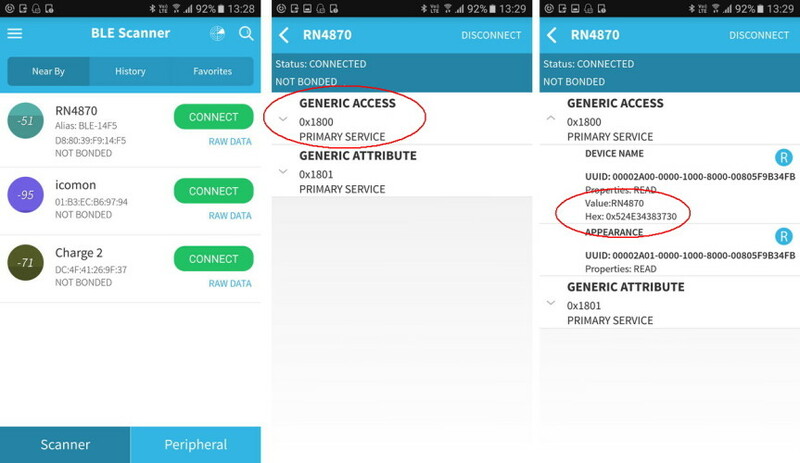 Use the BLE scanner app to connect to the RN4870. When you break the connection, the RN4870 outputs a “%DISCONNECT%” message. For a full list of the GET commands see the data sheet. Please note I am using a module with 1.30 firmware. 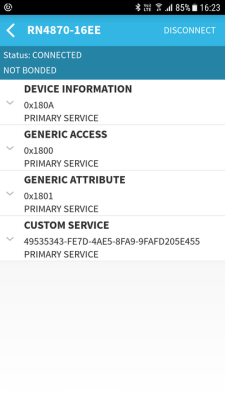 Firmware 1.30 comes with a set of default services and characteristics built in and we can use these to try out making a connection. I am keeping it simple and using the Arduino IDE with the same serial adapter and BLE Android app as above. The RN4870 is on and in data mode. 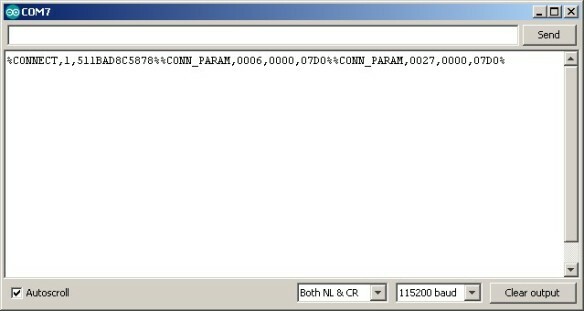 In the Arduino IDE, select the correct COM port and open the serial monitor. Start the BLE Scanner app, if it does not automatically start scanning, hit the Scanner button at the bottom. You should see the RN4870 appear in the list. We can now try sending data to the serial monitor. 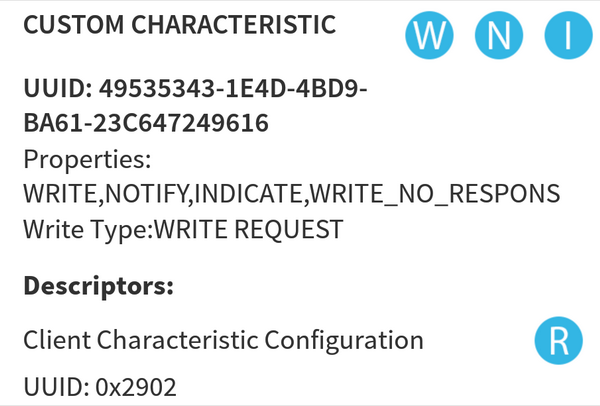 The RN4870 receives data via the 49535343-1E4D-4BD9-BA61-23C647249616 characteristic. Click the notification button to turn notifications on (The indicate button also works). 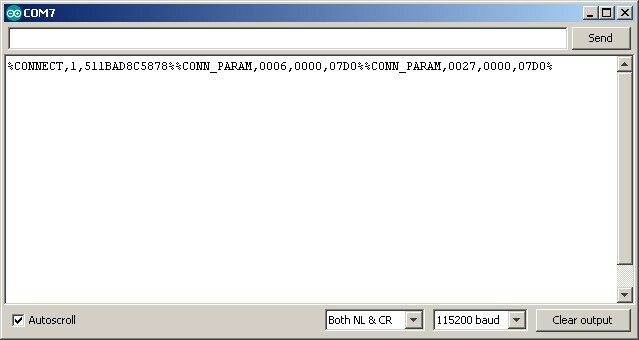 In the serial monitor enter “hello to you” and click send and “hello to you” should magically appear in the characteristic. In the above example I use Notify to confirm when data has been received but you can use either Notify or Indicate so what’s the difference? Notify does not need an acknowledgement, Indicate does. This makes Notify a little faster but less reliable. Notify also allows for constant data flow whereas Indicate has to wait after each piece of data for the acknowledgement before it can send the next piece. Here is some data, get it while you can. Here is some data, have you got it yet? wait, wait… Reply “I have it” received now I can send the next data. Here is some more data, have you got it yet? wait, wait… Reply “I have it” received now I can send the next data. I like to think the modules have conversations with each other. 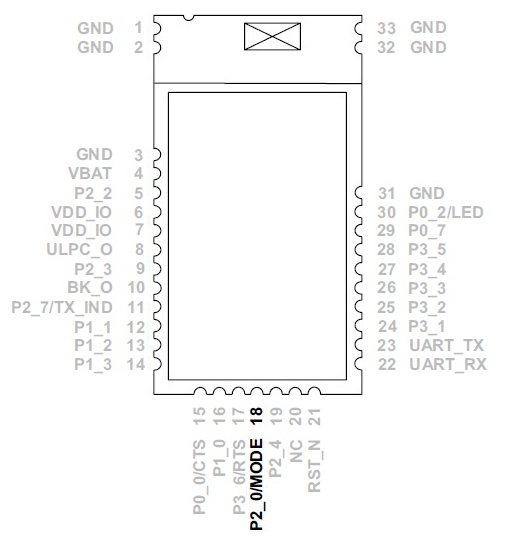 The RN4870s have a transparent UART layer built in. This means it is easy to get them connected and start sending data. This is very similar to how the HM-10s (and similar modules) work, and, if this is all you need you might as well go with HM-10s. They are cheaper and come on hobbyist friendly breakout boards. To get started I am using modules connected to the same computer with usb to serial adaptors. The same ones as above. One of the modules is on COM 7 and the other is on COM 8. I am using the module on COM 7 to initiate the connection. Everything is manual. The modules I am using have firmware 1.30. Creating a connection is straight forward as long as you have the MAC address of the remote module. If you have the address you can simple use the connect to mac address command. If you don’t have the address then you can scan. Scanning returns the mac address and the name of found modules. The address for the device I want to connect to is D88039F914F5 but I’ll pretend I don’t know it. 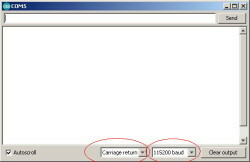 On the main device, enter command mode with “$$$” (no EOL characters). Enter SS,C0 to enable the UART transparent service. 1 – the type of address, 0 or 1). 0 for public address, 1 for private address. If the connection is successful you will get connection messages in both serial monitors. You will also need to know the COM port the usb to serial adaptor is using. In my case it is COM 7. 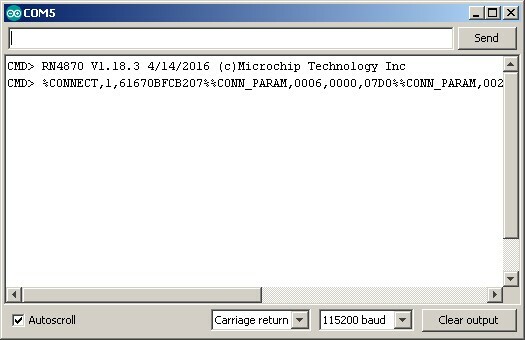 The update tool and the firmware can be downloaded from the Microchip RN4870 page. Click the Documents tab. You can download the data sheet and user guide from the same page. To put the RN4870 in to programming mode we need to bring pin P2_0 low during boot. P2_0 is the bottom centre pin. On the larger breakout board, closing the jumper connects pin P2_0 the GND. 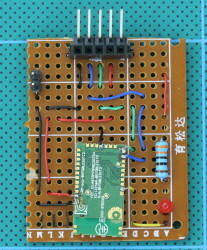 On the smaller board, the wire is used to connect P2_0 to GND. This is a very lazy solution and not really recommended. I have killed more than one Arduino because of this technique. It is easy to short something that shouldn’t be shorted. I am updating from firmware 1.18.3 to 1.30. FW 1.30 was released on May 4th, 2018. Although there is information online that the LED is solid on, for me the LED is off. Apparently, if you connect the LED the right way round it works correctly, it is solid on when the module is in programming mode. Who Knew? Me if I’d read the data sheet correctly. Thanks to Jon Raymond for pointing this out. Open the isUpdate.exe file (Installation is not required). Click Connect. If the module connects you get a “Port connect -> COM7 message” (or whatever port you are using) and the programming buttons become active. 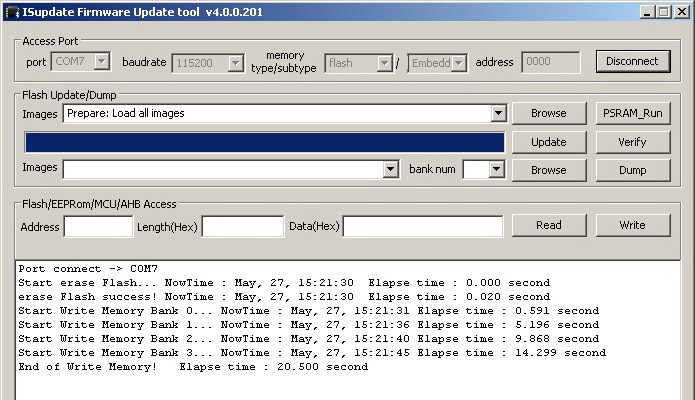 Now click the Flash Update/Browse -> Images, Browse button and select the 4 firmware files. 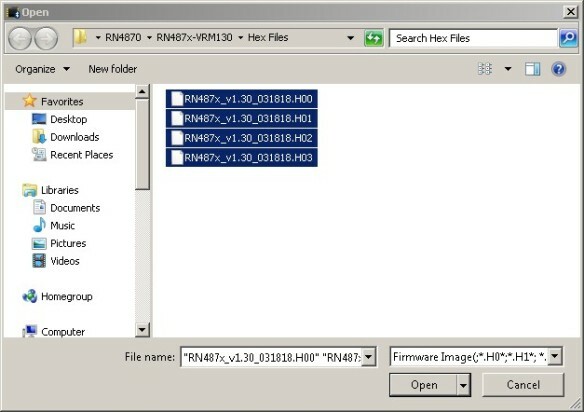 You can select all 4 files in one go. And then click Update. If everything is fine the update should start. The “End of Write Memory” message indicates it’s finished and that’s it. – Close the isUpdate app or click the Disconnect button to release the COM port. – Check the firmware with the “V” command (requires the CR EOL character). Release notes are included with all firmwares but the notes only include the changes for the latest version (no history). If, like me, you are jumping a few versions you will need to check the release notes for each firmware version to know what all the changes are. 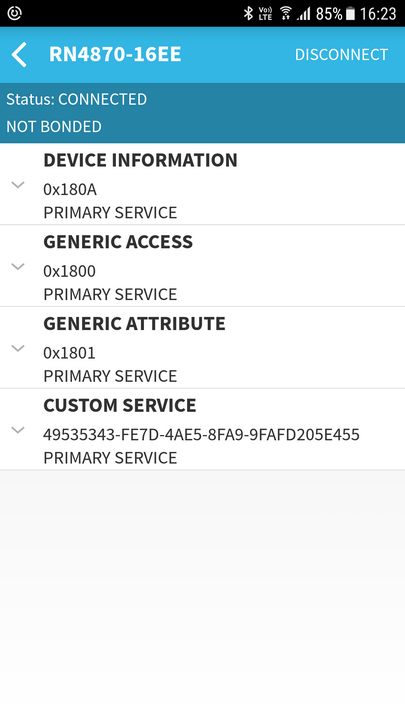 After updating, use a BLE scanner app to check the default services and characteristics. This post will continue as I get time. 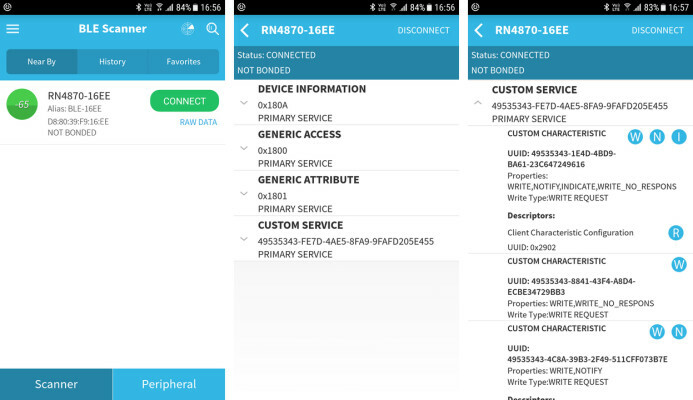 This entry was posted in Android, Arduino, BLE / Bluetooth 4, RN4870 by Martyn. Bookmark the permalink. The RN devices only support single connections. For a piconet you would need to use devices like the BTLC1000 and SAMB11. These support up to 8 simultaneous connections. I don’t know much about the Raspberry Pis but I can’t see why this wouldn’t work. The only thing I can’t determine is if the Pi can have more than 1 Bluetooth connection at a time. If not you would need to connect to each node in turn. I have RN4871. I followed the all sentences from your article. I have a connection between reset and GND via 1uf electrolytic capacitor. Also, there is 4.7kohm between reset and 3.3V. I left the P2_0 pin idle. I connected to USB TTL module. And I try to make communication by tera term. My problem is that the device is reboot by itself without any reason simultaneously. Sometimes I write $$$ then it enters the CMD mode. Also, I can write V or D, but it reboots again. I couldn’t find any reason. I used ceramic cap for the 3.3V and GND. do you have a stable power supply that can deliver enough current? I gave power from arduino uno, nucleo 32 and usb uart ttl board. I have been reading all your posts on the HC-05, HC-06 and now the RN4870. I have a piece of electronics that uses an HC-06 to link to Android apps and Windows software. But it will not of course link to anything iOS. Is it possible to set up an Arduino with an HC-05 as a master and link to the HC-06, and then pass the data thru to the RN4870 so that iOS can at least recognize the RN4870. Yes. The Arduino would just act like a relay station very similar to the serial pass through sketch above. You would simply connect the electronic device to the hardware serial and have the Arduino relay whatever is received to the software serial. This can work well if hardware serial is available, especially if the device uses a high baud rate like 115200 or higher (software serials do not handle fast baud rates well). 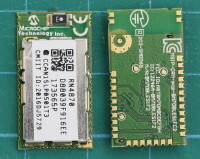 If the device uses a lower baud rate to connect to the HC-06 then it could also be done using 2 implementations of software serial. In this case I would recommend using different libraries such as SoftwareSerial + AltSoftSerial so that both can be active at the same time. A reliable solution would depend on how much data is being transmitted and fast it needs to be sent. BT classic has a much faster throughput than BLE and handles large volume data much better. 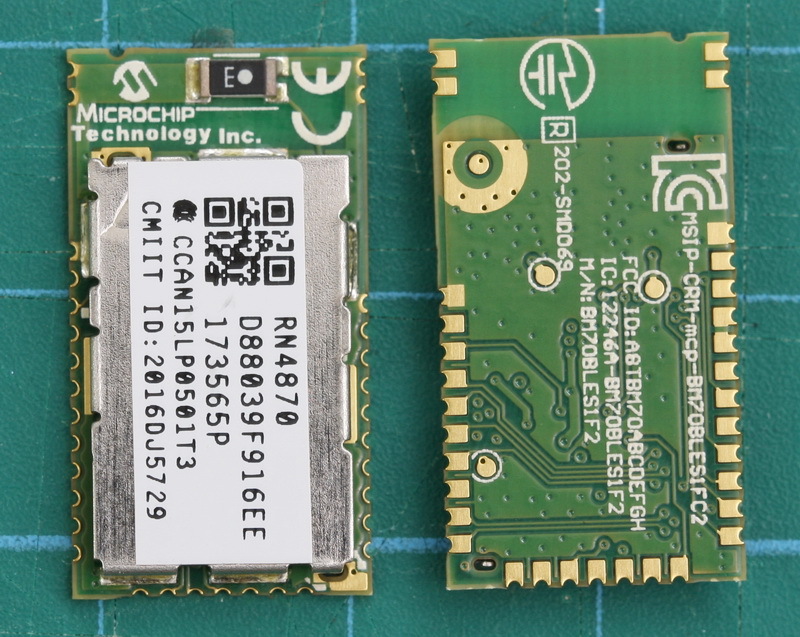 If you have access to the device it may be possible to replace the HC-06 with a BLE module such as the HM-10 or RN4870/1or any module that talks UART. This assumes the device is not controlling the HC-06 and the HC06 is simply acting as a serial bridge. Thank you for the helpful info and the quick reply. I wish I could replace the HC-06 on the device, but it is not doable. That is why I am looking at this “relay” workaround. So if I understand correctly I can have both the HC-05 (master) and the RN4870 wired to the Arduino. Use the HC-05 to link to the HC-06 on my device, and then have the RN4870 link to an app on an iOS item (Ipad, Iphone). I am getting started with Bluetooth BLE, and am following your website. 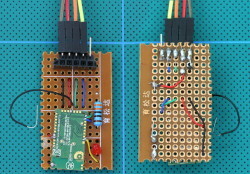 I have built a simple breakout board for RN4870 module with a USB to UART interface. I have worked my way through your instructions to about halfway, stopping at “Connecting Two RN4870 Modules Together”, Everything works fine, so thank you for excellent guidance. 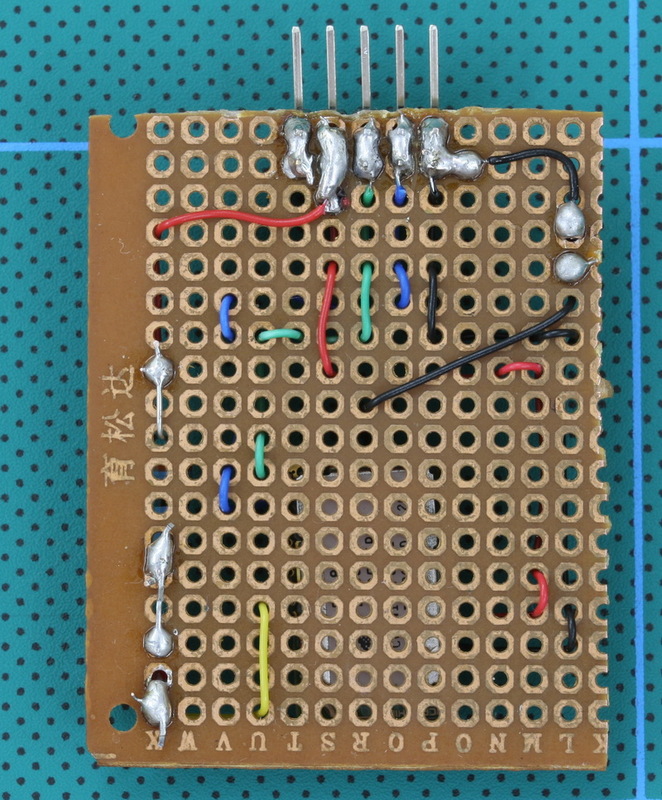 using the same breakout board with some pots, LED, switch, added instead of the PICtail board. Again, everything works as expected, including communicating with BLESensorApp on an Android smartphone. On my Windows 10 PC I have used the Arduino IDE as you suggest, and also the CoolTerm terminal emulator. They both work fine. 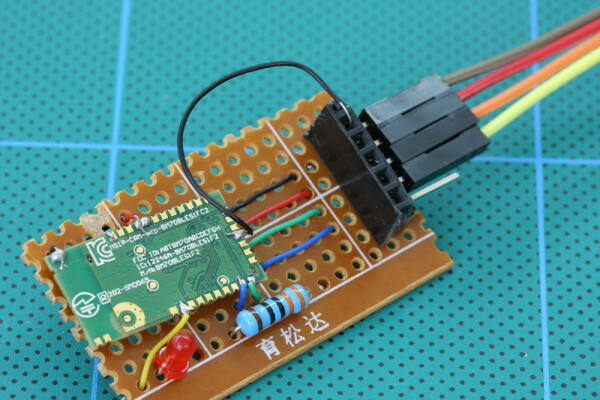 I would now like to move on to my real objective, which is to connect a digital temperature sensor to my breakout board and capture the readings on my PC. I do not foresee any difficulties at the board end, as I am well able to deal with the hardware, and expect to be able to program the RN4870 as required ( Or alternatively to write a script ). My problem is what to do at the Windows PC end. Neither of above terminal emulators appears to meet my objective, i.e. to capture temperature readings and present them on screen, and also to save them to a file. I should mention that I plan to capture readings say every 15 mins over a whole day, and save them together with time and date stamp. 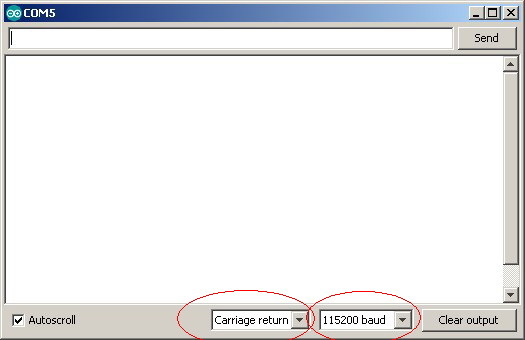 I guess a program could be written in Visual Basic to do this, but my knowledge of VB is very limited. My feeling is that something like this should already exist, perhaps a Windows version of the BLESensorApp, but I havn’t managed to find anything. Can you offer any advice or point me towards a suitable program? Thanks and best regards, Ken. I replied by email by mistake and not sure if you received. A while ago I started to look for a suitable app but got side tracked with work, decided to create an Android app and never looked at VB again. Visual Basic (or C or C++) should not be too hard for you and a google search brings up quite few resources about the Windows BLE services. Not sure how complex using BLE on Windows is though. I suppose it depends on how much of the work the services do for you. “If you are looking for a plug&play BLE dongle that will make your PC BLE capable then BLED112 is not such a product”. So perhaps I first need to find another BLE dongle? Martyn- Thanks you for another excellent article on Bluetooth modules. I would appreciate your comments regarding the appropriateness of the RN4871 for my first Bluetooth project. I’m considering using the RN4871 module as serial passthru device to transfer data from an old serial instrument (TX only, no flow control) to a tablet. Question: Once the 4871 is configured via the UART interface (no scripting allowed) and removed from the programming device (PC via Serial), will the 4871 retain functionality to perform as a “stand alone” serial pass through device? I’ve ordered and received HM-10 devices and I have found out that I simply cannot operate within the chaotic environment this device has generated. You don’t say which tablet but if it is Andriod I feel you would be better with the HC-05 or HC-06. These use the simpler BT SSP profile. They don’t work with Apples IOS though. To answer your question. Yes, once set up the RN4871 remembers the settings. What was the issue with the HM-10s? I have moved away from these now but in the past I used them in some fairly wifi polluted environments without too much issue. The only thing I really noticed was that the distance they could be used was reduced. Without really knowing, I suspect if you have issues with the HM-10 you are likely going to have issues with other BLE modules. Thank you for the response. I’ve ordered HM-10’s from multiple sources and have received (mostly) counterfeits. It takes a few hours of sleuthing to determine exactly which modules have been sent, and even with that information the command set (usually) doesn’t agree with the data sheet (if there is one). Additionally, emails to HM regarding certified suppliers go unanswered. I’m investigating the RN4871 solely because of the EXTENSIVE data sheet, and availability via a known distribution network. Yes, I did receive your email — many thanks and apologies for rather tardy reply to it. Meanwhile, I have bought another dongle, the ASUS USB-BT400 USB Adapter. I picked this one because it seems to be generally recommended as reliable and problem-free. I have installed it and it appears to work properly. I can pair it with my Android phone, and transfer files via it. I can also pair it with my board with RN4870, and I can see from the terminal emulator that the last program I installed for the PICtail board is still running correctly (ie reading sensor info and displaying that on the BLE app on the phone). But I am again stuck at this point, and have no clue about how to get the sensor data on to my PC. So I will follow up on the Silabs links you give, and also try the Microchip forum, although my past experience with that is not very good. Thanks again for your help, and excellent article. Ken. I bonded (2) Microchip RN4870 BLE FW V1.3 modules, but found that they can disconnect on their own (even the Microchip Eng told me to code into the Features to “reboot” upon disconnect, which I think confirms that they have this bug). In looking at RN4870 internet posts, I found other people having problems with these modules, and someone recommended the Silicon Labs (purchased AckMe) AMS002. I purchased 2 of the Bream (AMS002) development boards from Digikey and they seem to work well, but I don’t see yet how to pair them yet (there is an unpair command, so there should be a pairing command). My question is, for a serial UART application, only needing to transfer small amounts of serial data back, and forth, what modules would you recommend? (2) HC-05’s, HC-05 / 06, SH-HC-08’s, HM10’s, HM-12, HM-13, or HM-17, or another? If power is not a concern then Bluetooth Classic SSP such as the HM-05/06. But if you go this route make sure you get good modules like the ones from Waven. These have a good firmware and are well supported. 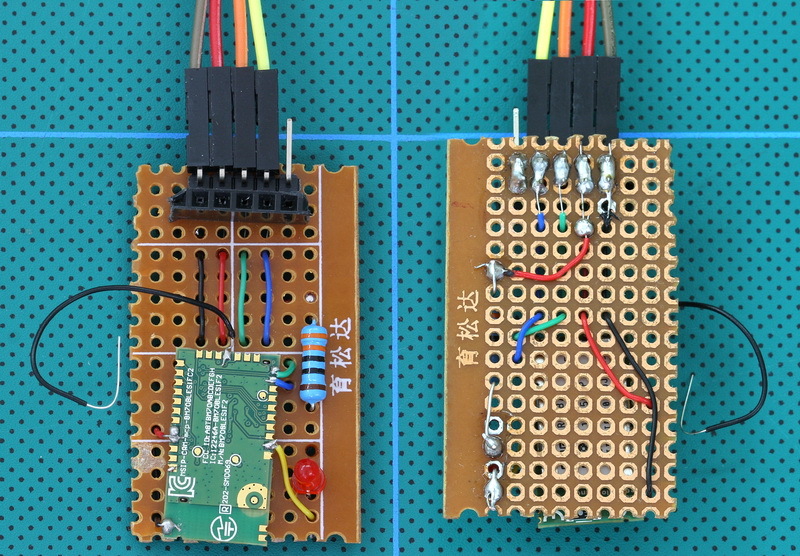 If power is a concern look at BLE modules sans breakout board. I’ve had good results using the HM-11. Good connections and fairly low power use. There are better options if low power consumption is critical though. Thank you. It is a very informative post. Have you tested the physical communication distance between module and phone? As far as I could remember, this module has a very poor signal strength. The smaller RN4871 is even worse. There is someone facing the same issue as well. I haven’t done any distance / signal strength tests but like you I am starting to find complaints online. Don’t know how much these reflect the real situation though. If it was really poor I would expect a lot more complaints than there are. I followed your instructions with a bit of variation using an adruino as a usb to serial port and am having some troubles. I get no communication from the board and any commands i send get no response from my computer. 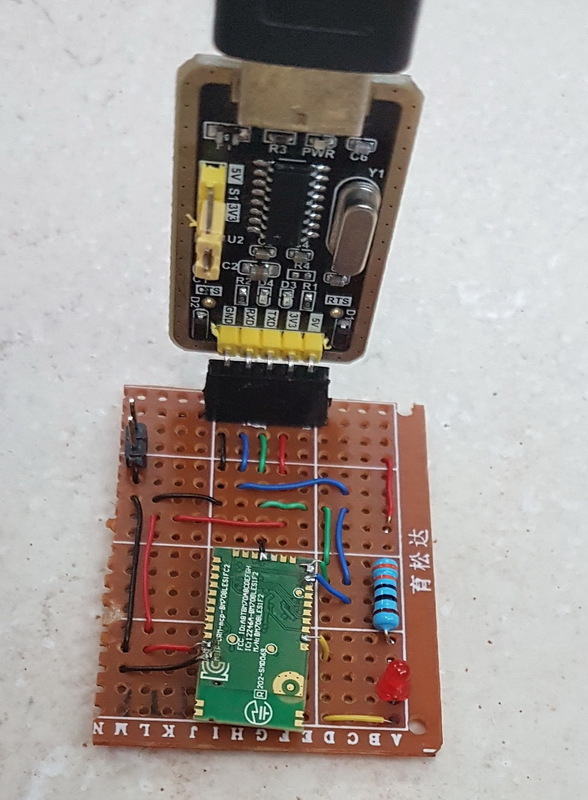 The led flashes the correct sequences when i try to connect via bluetooth (cant communicate there either) or ground pin 18 so i assume the board is working correctly and im just unable to communicate with it. i also tried reflashing the board but the connection failed using isupdate.exe. is there an extra step to connect this board using an arduino? i did the standard ground to reset on the arduino and same tx->rx and rx->tx but still get no response. It’s not clear how you are using the Arduino. 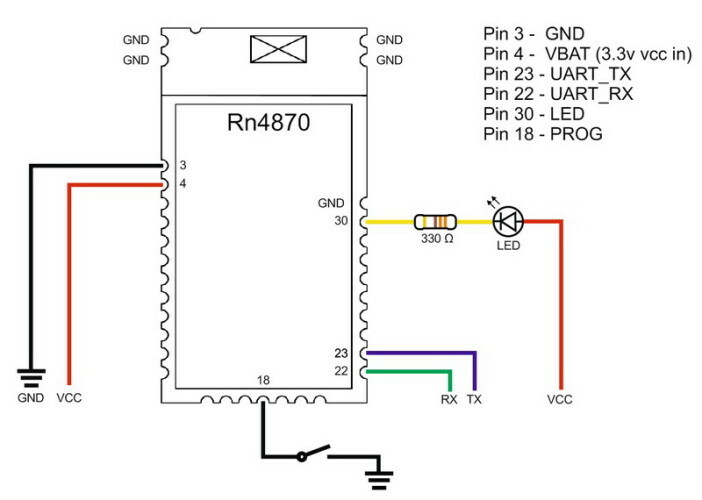 Are you removing the AVR and using it as a serial to usb or are you using it with a serial pass thru sketch? This is a fantastic tutorial; thank you so much. 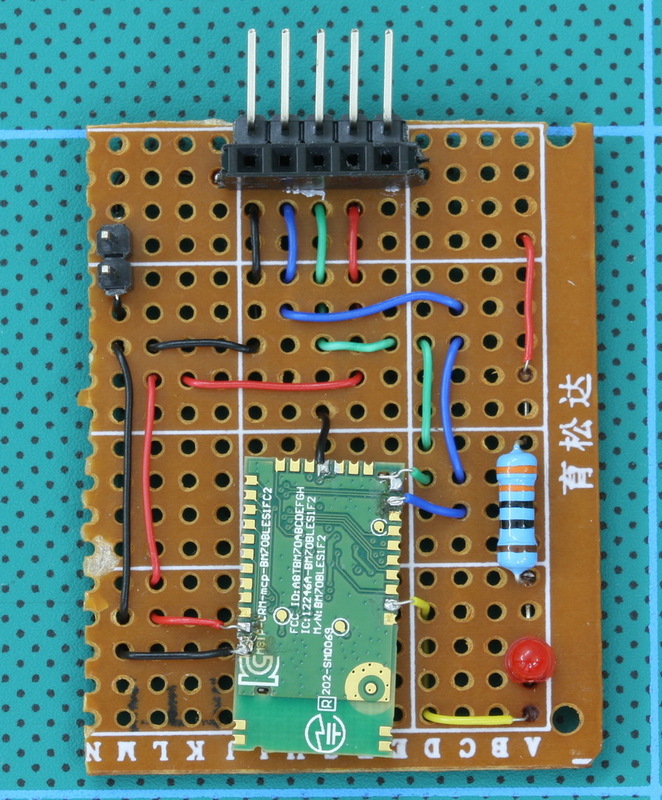 It has allowed me to move forward in my attempts to prototype a BLE peripheral. I’ve had success following this tutorial, communicating between an iPhone and an RN4871. Oddly, the same attempts fail between an Android phone and the same RN4871. In both cases, I use the Nordic utility; “nRF Connect” on the phone. Below is the sequence of status events on the RN4871 I see in both cases. It seems to require many attempts before a connection is successfully achieved. What I find particularly mysterious is the difference of the 2nd parameter in the %CONNECT% status. When the iPhone is trying to connect, it is always ‘1’. When the Android phone is trying to connect, it is always ‘0’. I can’t find an adequate reference to explain this. Would you have any insight on this that you could share? Thank you again! Please disregard the previous question. I determined the problem. My RN4871 proto-board had power supply problems. Once I fixed that, the connections are quick and solid, from iOS _and_ Android. 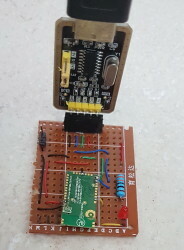 I’m trying to use the RN4871 connected to a temperature sensor to transmit the temperature values in adverting payloads. However I don’t know how to take my variable or the analogue input and add it to the advertisement packet. In the User guide I’ve looked at the example code under 2.6.20 and seen how they enter a direct value but don’t know if it’s possible to put the variable name there or the analogue input. My aim is to have the module running off the built in script as it seems like quite a simple process.